What Is It Like to Eat a Meal in France? Before you begin working your way to foreign language fluency, it helps to understand the culture behind the language you’re learning. After all, language exists to help a group of people express their ideas and beliefs. France is an old country with a rich history and culture. As you begin your French language program, gaining a strong grasp on this history, the values, and the etiquette will help you rapidly achieve success. In particular, the French place a great deal of importance on eating well and enjoying the entire dining experience. In French culture, the ideas of lunch and dinner are somewhat reversed when compared to North American culture. The French embrace the two-hour lunch between 12 p.m. and 2:00 p.m., which is typically the largest meal of the day. The further south you travel, the more likely you are to find that lunch is followed by a nap, à la their Spanish neighbors. Dinner may also be a lengthy and large affair, which typically starts much later than dinner in North America. Do not be surprised if you are invited to dine in the evening, and are given a starting time of 9:00 p.m. Lunch and dinner follow the same pattern of aperitif, followed by hors d’oeuvre, main course, salad, cheese, and dessert. After dessert, you will have coffee and maybe a “digestif” (Cognac, Armagnac, or the local eau de vie). The demands of business and fitness awareness are changing this routine, but remember that the French invented nouvelle cuisine. As opposed to changing the sacred tradition of the lengthy lunch, they instead changed the food to include lighter ingredients, less prone to causing issues such obesity and gout. Few things are frowned upon more in French culture than being overweight. A rather unique and delicious French offering is that of “crème de cassis,” or blackcurrant liqueur. With it, one can make a popular wine aperitif or “apéro” from kir or kir royal, which mixes the crème de cassis with white wine or champagne, respectively. C’est tout à fait délicieux! As opposed to the North American meal, where the salad begins the meal, in the French tradition it will follow the main course. This is believed to aid digestion, as the roughage and fiber in the salad will help to clear the system of the heavy starters and the main dish. Next comes the cheese. Room temperature, pungent, and slightly runny, this course is often the most foreign to those not used to the French menu. Take advantage of the experience, and dive in to the variety. Usually up to three different cheeses are served. Be sure to clean the palate with a mouthful of wine before changing cheese, so as not to confuse the flavors. The meal ends with dessert, ice cream, or fruit, and is followed by black coffee, or maybe a “tisane” (herbal tea). Afterward, a “digestif” (brandy or a liqueur) may be offered. French restaurants generally display their prices outside, and inside on chalkboards or something similar. If prices are not displayed, the restaurant is letting potential patrons know, “If you have to ask, you probably should not eat here.” Many restaurants will offer a fixed price “menu touristique” (or “menu gourmand”), which is not for greedy people, but for people who like exceptional food. If you’re looking for large portions, definitely head to the Alsace region. In most French restaurants and cafés the bill will be marked “service compris.” This means that service is included in the price. If it is marked “Service non compris,” then you are expected to add 10 to 12.5 percent of the total to the bill. Even if service is “compris,” it is common to round up to the nearest Euro, and leave the change on the plate. Throughout France, farmers markets and fresh produce stands operate in most, if not all, towns and villages. Finding the nearest market isn’t difficult at all. By contacting the local town hall (“Mairie”) or tourist office (“Syndicat d’Initiative”), visitors and locals can find out which markets are open for business. In addition to fresh fruits and vegetables, most markets also offer selections of homemade cheeses and freshly butchered meats directly from area farmers. Each “arrondissement” throughout the city of Paris hosts Saturday markets in the squares. In going to one of these markets, it’s especially important to bring your own shopping bags, as many markets won’t supply them. In addition to foods, many markets also offer other goods, such as antiques and second-hand items. Similar to the flea markets of the United States, these junk markets (“brocante”) are popular throughout France. The Porte de Clignancourt, France’s most famous flea market (“marché aux puces”) can be found in the North of Paris. For the French, these types of markets are popular and worthwhile ways to spend their time. Similar to the malls and shopping centers found throughout the United States, many of the French enjoy attending the markets. Even if it’s just a way to spend a sunny Saturday afternoon or Sunday evening, the market is the place to be. Much like the shopping centers that flourish throughout Britain, these markets are viewed by the French as major hubs of social activity. Navigating a full French menu is somewhat intimidating for the uninitiated, but a few tips will help to make your dining experience both fulfilling and enjoyable. In this entry, we will address the start of the meal, following the apertif. Many restaurant, particularly the nicer ones, will offer an “amuse-bouche” (mouth waterer) of fish or pate, on the house to start things off. Depending on the establishment, a sorbet could be offered between courses to cleanse the palate. After your amuse-bouche (and perhaps a little sorbet), you will receive an hors d’oeuvre, often consisting of “crudites” (raw vegetables), “charcuterie” (cold sliced meats), or shellfish. While the pattern of the traditional French meal does not vary, the content does. This is highly dependent on the geographical region that you are in. For example, Normandy is famous for extra rich specialties cooked with butter and heavy cream coupled with cider and Calvados (an apple brandy). Burgundy is famous for dishes cooked in wine, Périgord for poultry preserved in its own fat, and foie gras. Alsace is renowned for “choucroute” (sauerkraut), which reflects its close proximity with the German border. In fact, one might say that Alsace combines French ideas on cuisine with German ingredients and portions. Try dining in Strasbourg and leaving hungry. C’est tout bonnement impossible! Far to south of France, Provence gave birth to the world renowned “provencal cooking.” Expect simple dishes with olive oil, garlic, tomatoes, and peppers that burst with robust and savory flavors. Pair these dishes with a wine from nearby Languedoc and prepare to experience gastronomical ecstasy. One final note, while you will most likely find salt and pepper on the table, use them with discretion, if at all. Seasoning your own food signals the kitchen that they did not do their job well, which could result in getting a cold shoulder from the staff for your upcoming cheese and dessert. Wine is the traditional and ubiquitous table drink, and in France, the “vin de la maison” (house wine) is always acceptable. Wine is served by the bottle (“bouteille”) or half bottle (“demie-bouteille”), or by the carafe (“pichet”). It is typically sipped right through the meal, but be careful; it is considered an egregious to get tipsy. An empty glass is quickly refilled, so leave a bit of wine in your glass if you feel you are reaching your limit. If you are ordering the house wine, you have some options in terms of volume. Carafes are available in 1 liter (1.1 quarts), 75 centiliters, 50 centiliters, and 25 centiliters. If you are on your own, ask for “un pichet de vin” (a small pitcher) or “un quart” (a quarter). This gives you a glass and a half. If you are with someone, “un demi” is probably enough, but in a group of three or more “une carafe de vin de la maison” (carafe of house wine) is appropriate. As starlight goes with romance, so goes food with wine. Few things are so emblematic of French culture as the countless vineyards producing the world’s best vintage tipples. From Bordeaux to Alsace, from Burgundy to the Côtes du Rhone, France is heaven on earth for those who have pledged allegiance to the brotherhood of the grape. For travelers, few experiences can compare to exploring the various wine regions of France, while pairing superb bottles of local “vins de pays” (local wines) with local cuisine. One drinks in the scenery between tastings and meals, and becomes intoxicated with natural beauty that abounds. Rolling hills bearded in vines hung heavy with grapes emit a scent that can only be compared to the richest of perfumes. Rocky outcroppings jut vertically towards azure skies in the Languedoc and Provence regions that have influenced artists from Fouquet to Van Gogh, while the waters of the Garonne flow through the Médoc, giving birth to “Premier Cru” and “Deuxième Cru” wines that are arguably the best in the world. Even the most hardened of wine noses will not be left wanting for variety. 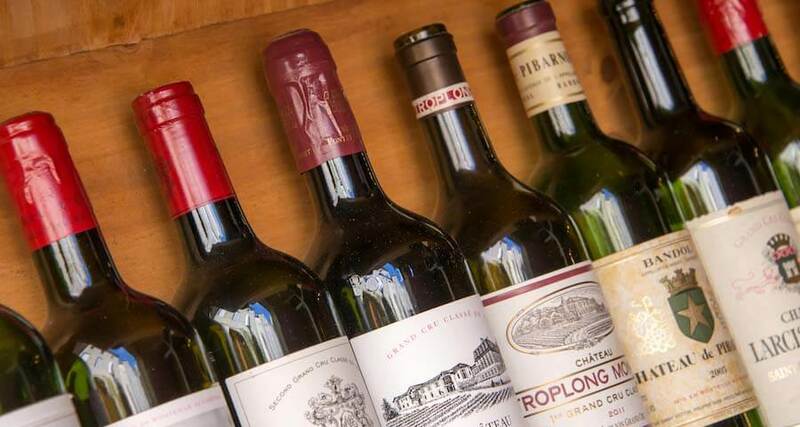 Burgundy wines, made from the Pinot Noir grape, tend to be slightly drier, while Bordeaux wines are made from the Cabernet Sauvignon grape mixed with a little Merlot. These tend to be fruitier and higher in tannin. Lighter Beaujolais wines of southern Burgundy are made from the Beaujolais Gamay grape, and the heavier Côtes du Rhone from a blend of nine different varieties. For those who prefer high quality whites, the Muscadet varieties of the Loire Valley and the Riesling white wines of Alsace will provide a full spectrum of bouquets and flavors. And we cannot forget to mention the most famous of all sparkling white wines on the globe, hailing from the Champagne region, located far to the north and centered on Rheims.